Easy to Use - SimpleTaste digital scale Step-On Technology, just step On the bathroom scale and get instant Readings in pounds or kilos. Easy to Read, Even in Dark Rooms - SimpleTaste personal weighing scale's extra large lighted LCD display, bright and clear, and the weight numbers will be locked after 3 blinks. High Accurate - SimpleTaste weight watchers scale with 4 high-precision sensors from Germany, weighing up to 400 lbs (180 kg.) with 0.1 lb (0.05kg) increments. Auto-Calibrated - Bathroom scale Auto-Zero, Automatically shut off after 10seconds of inactivity, Save Batteries. 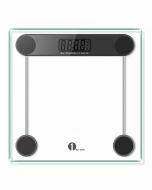 Safety and Comfortable - This weight scale has 6mm sturdy thick tempered glass, Large 12" x 12" platform, never need worry crack or fall down. This weight scale uses 4 high-precision sensors, its accuracy can reach 0.05kg. Getting this accurate and comfortable body weight scale, you can track your body weight easily now, begin keeping your body in control. 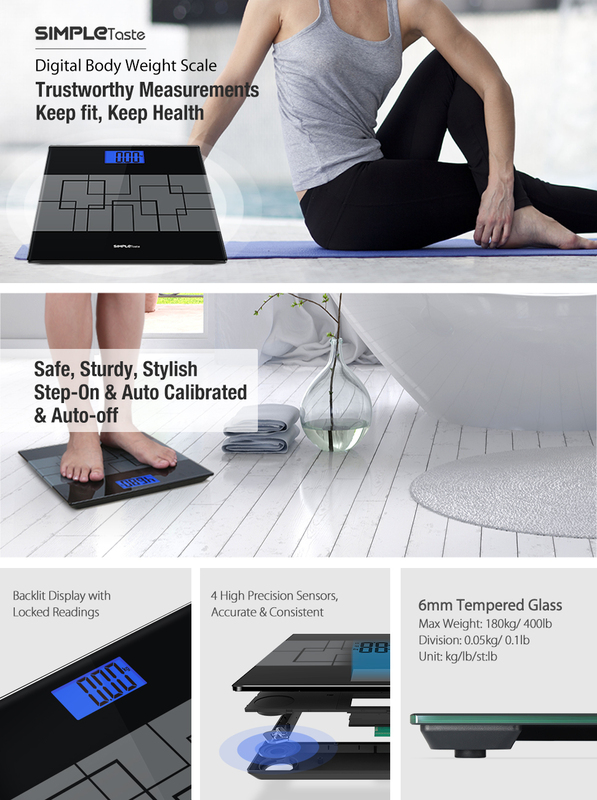 Just step on it and get your weight number instantly, Auto-calibrated, no need press power button or tapping to active it before each use, enjoy your each weighing now. Big backlit LCD display, bright and clear, easy to read in a variety of lighting situations. 4 high precise sensors ensure the accurate measurement, never missing the changing of your weight. Made of durable, strong tempered glass, bear weight up to 400 lbs / 180 kg, large 12" x 12" platform with 4 non-slid pads, comfortable to stand on and never worry about crack or fall down. Please put the scale on flat hard ground to get accurate weight numbers. Body weight scale is not for light objects, If you want to weigh something below 11lb/5kg, it is recommended to buy our kitchen scales or food scale, most accurate scale will improve and change your life. A person's weight lightest at morning and heaviest at night. The difference between them is about 1 to 6 pounds. So we recommended to weigh at the same time period per day. Does this weigh in kilograms and pounds? Yes, you can change your units through pressing the bottom of the scale. Test: 1)Take weight on scale. 2)Pick up 0.1-0.5 lb object. 3)Take weight again within 30 seconds. Does this scale show the same reading both times? The scale can weigh objects up to 400 lbs (180 kg.) with 0.1 lb (0.05kg) increments. We here recommend you to use the scale on a flat, hard surface and keep the scale in a single location without moving it, all these actions will make your data more accurate.